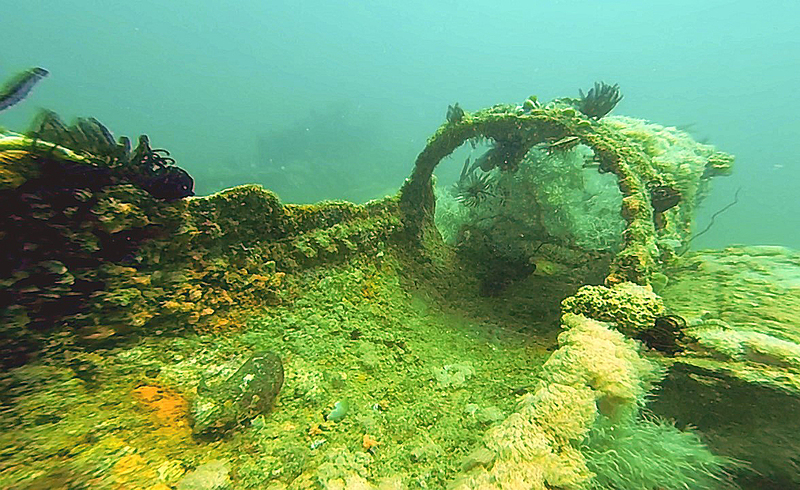 A BOILER OF THE SAN QUINTIN © 2015 CHARLES W. DAVIS JR.
For decades, we have called the San Quintîn wreck a gun boat. Recently I started to try to find a better description of the San Quintîn to improve what we know and possibly find a photograph or one of a similar vessel. In the process, I found some items that did not fit with this wreck being a gun boat. Over time, I decided to start researching based just on the name and the reason it was sunk. Once I eliminated that it was a gunship, I was able to find other references to a Spanish ship by the same name. After a couple hundreds hours of research, I was able to find an authority reference to the sinking of the Transport San Quintîn. The San Quintîn performed numerous duties until she was scuttled in 1898. Some times she was a mail ship, providing service from Manila to other Spanish outpost. At others, she performed duties as a Armed Transport. Many times she was accompanied by the Armed Transports Cebu and Manila. I am sure there may be those who not accept my version of the ship’s identity on face value, and others who might appreciate the steps that lead me to the history. I will post a separate article, giving more details on the research itself. In 1850, the British and North American Royal Mail Steam Packet Company ordered four identical iron screw Passenger/cargo vessels from the Scottish ship builder William Denny & Brothers. They were the Andes, Alps, Australia and Sydney. The ships were listed as 1275 grt/866 nrt , the length of 236.6 feet (72 meters), beam of 33.2 feet (10.1 meters) and depth of 24 feet (7.3 meters). The ships were mail ships. These were basically passenger ships that also operated under a contract to transport mail. The ships were design to carry 62 passengers in first class and 122 in second class. Prior to these ships, all the ships of this company were side wheelers and most wood. Only a few more side wheeler were built by the company after this and no more wooden ships. In 1850,the British and North American Royal Mail Steam Packet Company changed their name to Cunard Lines. Before being completed, the Australia and Sydney were sold to Australian Royal Mail Steam Navigation company. The Cunard Lines took possession of the S/S Andes on August 18, 1852 and the S/S Alps five weeks later. 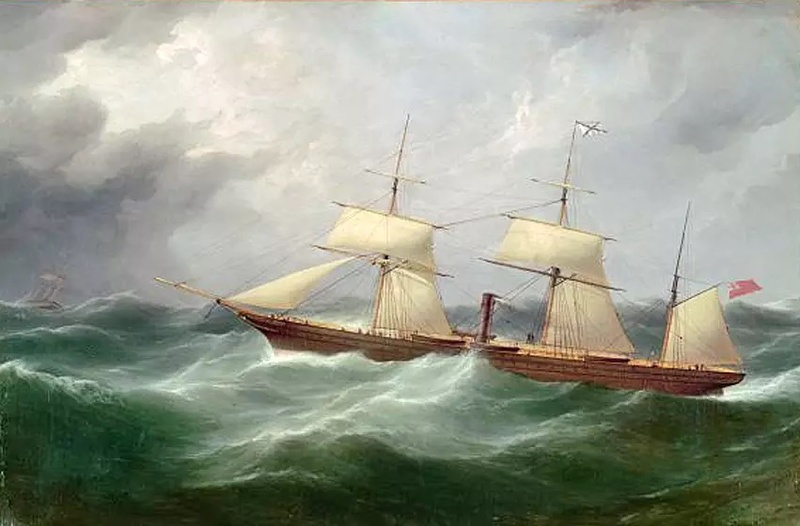 The S/S Andre made its maiden voyage to New York sailing from Liverpool on December 8, 1852, however, problems with it propulsion system forced them to return to port. The problems were corrected and the ship arrive in New York on Christmas Eve. The Ship continued to sail that route until 1854. In 1854, with the out break of the Crimean War, the British government leased the S/S Andes and the S/S Alps. The two ships were initial used as troop transports and later the S/S Andes was used as a hospital ship. After the war, they returned to service with Cunard Lines. In 1859, the Spanish government bought both the S/S Andes and the S/S Alps. The S/S Andes was renamed to the San Quintîn and the S/S Alps renamed to Mandingo. The San Quintîn’s initial role seems to be primarily as a mail ship. Note on names: The Andes is often shown as Andes (1852). This is to keep it from being confused with two later mail ships named Andes in the 1900s. San Quintîn is also seen spelled as San Quentin. While there is not a definitive history of the San Quintîn, there are many historical references to her. Cuba seems to have been one of the early assignments for the San Quintîn. The New York Times has a number of mentions of her arrivals and departure from Havana. This is from a NYT story of March 1862: The steam transport San Quintin, of the Spanish Navy, which arrived a short time ago from Vera Cruz with nearly two hundred sick soldiers, left again for the same place the day before yesterday, with provisions for the army and forage and maize for the horses and cattle of the expedition. The Micronesioan Area Research Center, Guam published in 1998 a book titled: Chronicle of the Mariana Islands. Recordings in the Agaña Parish church 1846-1899. This book is a translation of the Parish records of the church in Guam. Most of the record was written by Father Aniceto Ibáñez and records the activities of the church and reflects the life in Guam. Only the introduction of the book is available on line. The introduction is mostly about the priest of the church. It notes that the entry for 1884 is short but does include that Father Franciso Resano return to Manila for health reasons aboard the steamship San Quintîn. 21 August 1885 the San Quintîn arrives in Yap to establish a capital for the Caroline Island. The following day the ship Manila arrives. 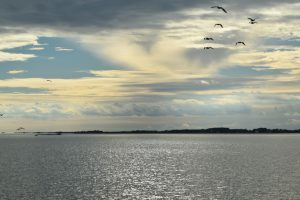 The San Quintîn, under the command of Capt. Guil de Espana, brought the new Governor-general, two priest (one being Father Aniceto Ibáñez as vicar) and others to Yap. Between the two ships they had soldiers, laborers and the materials needed to build a church and the governor’s residence. The ships were unloaded, however, the governor did not like the location. The group spent three days searching the surrounding areas until they found a location the governor’s liking. He sent runners out to notify the locals to be at the location the following morning for a flag raising ceremony. When the group arrived back at the ship, they found the German flag raised and the German cruiser Iltis in port. The Spanish withdrew, however, the public backlash almost caused a war between Germany and Spain. Some reports state that it was the S/S Carriedo that accompanied the San Quintîn. This was the transport Manila’s name before being purchased by Spain. It was owned by a private firm doing mail service between Manila and Singapore. March 14 1887 the transport Manila transported a new Governor-general by the name of Posadillo, soldiers, priest, workers and colonist to the island of Pohnpei. They were to set up a government and establish a colony. The actions of the new government was harsh on the natives mostly the actions of the governor’s executive Manuel Torres, a Spaniard born in the Philippines. At the end of June, the natives refused to work. Posadillo send Torres to the chiefs to demand they attend a meeting, Spanish soldiers were sent to enforce the attendance. The natives killed most of the group. Those that survived reported back and the colony evacuated to a ship that had been grounded and damaged. The Governor stayed in his residence until 3 July, when he tried to escape to the ship. He and all of is staff were killed, however, the Filipino troops were left unharmed. The natives offered to let the colonist return home unharmed but they stayed onboard ship. In August, The San Quintîn arrived on a routine run and discovered what had happened. She left behind supplies and reported the event to Manila. In 1891, The transports—the Manila, Cebu, San Quintîn, and Marquez de Duero carried an attack force of 1,240 men against the Maguindanao and Maranao (Muslims in the southern portion of the Philippines). The attack was unsuccessful. Moro reports had the transports Manila, Cebu, and San Quintîn bringing supplies to the Spanish Colonies in the area until 1894. No Spanish records confirm this. Current records show that the San Quintîn was decommissioned in 1894. In his nearly 1,000 page book “ The Spanish American War” published in 1911, the noted Naval Historian Rear Admiral USN (retired) French Ensor Chadwick discusses every naval aspect of the war. At the beginning of the war, then Captain Chadwick was chief of staff to Admiral Sampson, commander of the North Atlantic Fleet. The Captain was also the commander of the USS New York ACR-2. The book shows a partial transcript of a planning meeting held on March 15,1898. Admiral Montojo meet with General Primo de Rivera and the Governor-General to discuss defense plans. The admiral’s plans were approved. The admiral issued orders to Captain del Rio to sink the transport San Quintîn and two old merchant vessels. While not specifying the type of ship, Admiral Montojo’s battle report verifies that the San Quintîn was sunk as ordered. Storms and the passage of time has reduced the wreck. 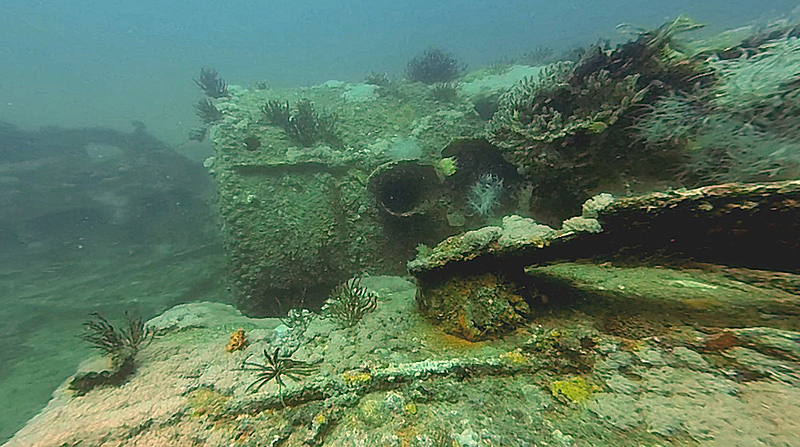 At the time of her being scuttled she would have been just below the surface. It seems likely that the majority of the ship is below the sea floor. Contains material © Charles W. Davis Jr. This entry was posted in Subic Bay, Subic Bay Dive Sites and tagged dive, philippines, san quintin, scuba, subic by Charles W. Davis. Bookmark the permalink.